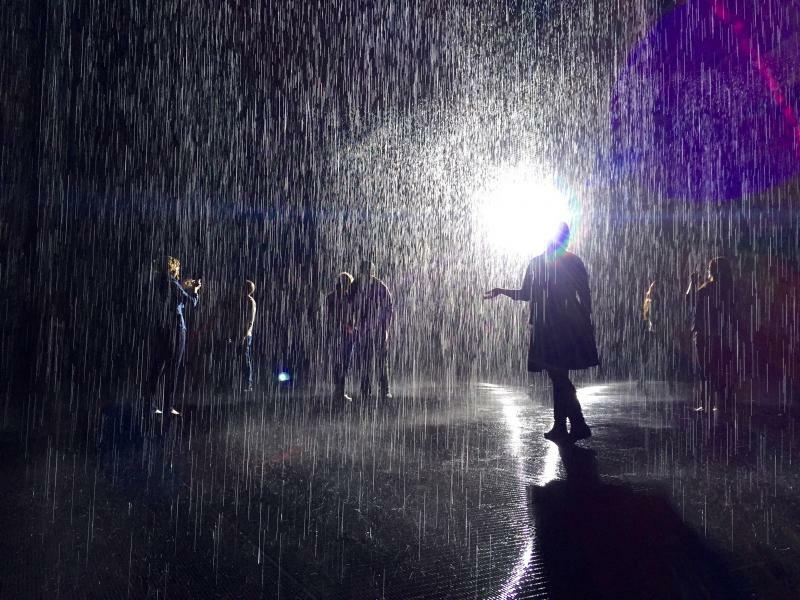 Random International’s Rain Room experienced wild popularity at New York’s Museum of Modern Art in 2013, and its temporary addition to the LACMA campus has already sold out weekend tickets through February. It’s no wonder—phenomenological art has always caused a splash, art that inserts the viewer into the space and invites them to experience rather than to view. Yayoi Kusama’s Infinity Mirrored Room – The Souls of Millions of Light Years Away at the recently-opened Broad Museum serves many of the same functions as Rain Room, at least where audience insertion is concerned. The artistic purposes, however, are quite different. Rain Room draws from LACMA’s Art & Technology experiment, a program established in the late 1960s that paired popular artists such as Andy Warhol, James Turrell, and John Chamberlain with certain corporations in the hope that it would foster a conversation between artists and engineers, biologists, and the like. The reference is clear, and LACMA makes a fitting home for Rain Room. 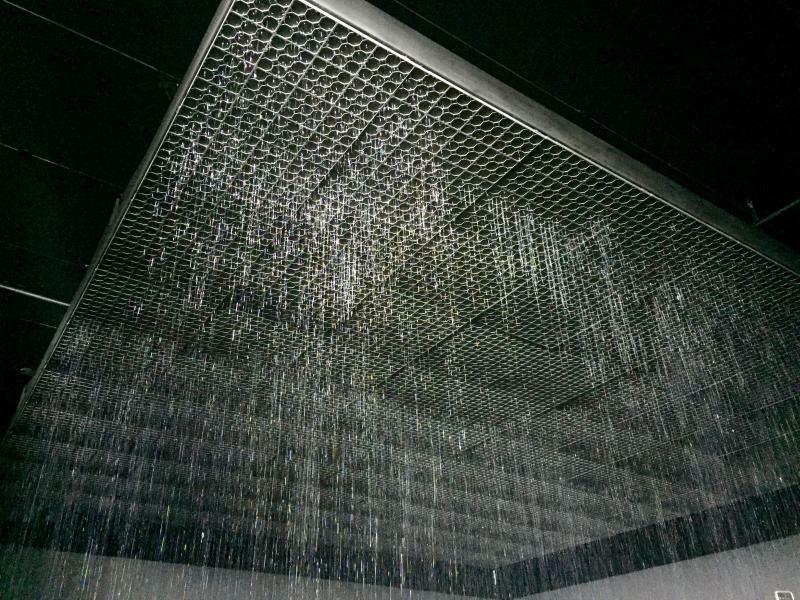 Even Andy Warhol’s A&T project involved indoor rain, but not at this scale. The installation is outfitted with sensors along each edge of the ceiling. When an object enters the space and the sensors register a disruption, the water shuts off within a certain radius of that space. It involves more trust than you’d think. The first thing you notice about it is the sound – the enveloping, overwhelming sound of falling water. Climbing the ramp to the actual room, you can see the shadows of the people and of the water against the wall. Then you step inside, and it’s a massive suspended ceiling in a small room, water falling in regular drips and drops. It’s controlled nature, that much is clear, but that’s hard to internalize when you make your approach. It’s a tentative process – a hand or a foot out into the stream, only to find there’s nothing there at all. Then the slow shuffle forward over the grated floor. Then the broad smile as you look up to the ceiling and find the near-perfect radius of halted sprinklers above your head. Not to mention the spotlight in the corner. Rain Room would be astonishing by itself, but with the addition of an oversized, near-blinding spotlight in the back corner of the room, everything is illuminated in stark shadows or bright lights. Your photos are reduced to artistic silhouettes or overexposed selfies. In this way, Rain Room is an act of contrasts that are constantly at play – wet/dry, light/dark, inside/outside. Even when standing in the middle of the floor, you’re acutely aware of the dry circle around you, the wet space just at the edge, and the dry room far beyond. One half of your body is always illuminated, the other cast in the deepest shadow of your own making. Rain Room has been called out for being something of a spectator gimmick, but there’s a deeper and more meaningful context to this piece in Los Angeles, specifically at LACMA. Not only is it a homage to a program LACMA loved and recently revived in 2014, but it’s a rare experience for an Angeleno to step outside to any rain at all. In an area where rain is so scarce, to hear the crystal clear sound of water falling is strangely affirming; it brings a human clarity and a human element to the experience, one where we are reconnected to our life source and one of Earth's most beautiful natural phenomena. Rain Room will be at LACMA through March 6th, 2016. To make ticket reservations, see the LACMA website here. Reach Contributor Katie Antonsson here.